Soccer mom (as defined by http://urbandictionary.com): Suburban mother with 2.3 kids with hollow disciplines and automaton husbands with slowly diminishing spirits. Typically Caucasian. Their cabals are usually averted to music unfamiliar to that of their youth. Soccer moms are mostly responsible for the gaggle of kid safe laws ranging from stop signs every two feet to inundating TV and video game ratings to the manufacture of the "V chip". They aspire to the halls of Congress and the floor of the Senate to champion causes in the name of their families at the cost of casual freedoms. They are reclusive, passive aggressive, morally ambiguous and secretive. One should be wary of traveling through a soccer mom's natural habitat as your presence will be secretly alerted to by the authorities under vague and even false suspicions. They also reside in urban and metropolitan areas. I signed Nate up for soccer. He's not even two years old. Pre-mom Amber would laugh at me.﻿ But he's not on a team or anything. It's just a mommy & me class put on by a local soccer organization. The coach gives the toddlers a set of instructions ranging from, "kick the ball into the goal" (which Nate can do pretty well) to "dribble the ball to the overturned goal, stop the ball with your foot, kick the ball through and then crawl through the tunnel after your ball." This is when Natey listens intently for the coach's whistle, then stands up, picks the ball up in his hands and runs as fast as he can away from the class. Yeah, following loads of instructions is kind of new and doesn't always go over so well. But I figure the class is a good opportunity to meet other moms in the area and gives Nate a chance to play with "KIDS!" (Nate will go anywhere with the promise of KIDS!) Plus, Nate really, really loves any play time that involves balls. Typical guy. 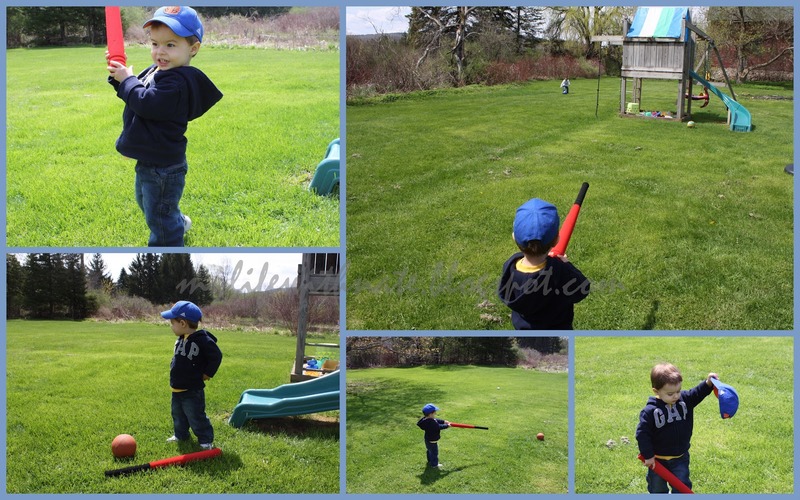 Nate firmly believes that a bat appropriately accompanies any ball, whether base, basket or soccer. And it works better when held upside down. Obviously. How about you? Sign up for any fun classes lately? Are you a soccer mom?